Solar technology is one of the most exciting inventions of the 21st century and it’s fast becoming a regular feature in a lot of modern homes and buildings. In fact, solar energy can be used to power pretty much everything in your home including your cooking appliances. The best part is that solar ovens specifically are versatile enough for both in and outdoor use. While the sun is a solar oven’s main source of energy, you can still use it even if it’s cloudy. Most of the solar ovens available on the market today have the same heating capacity as your normal gas or electric oven, which means that you can use them to cook, boil, bake, steam and grill food with ease. Plus, there are many other advantages that you can enjoy from using a solar-powered oven, from saving tons of money in electricity costs to being able to carry them around anywhere. Unlike outdoor grills and camping stoves that come with a fire hazard warning, solar ovens are completely safe and are the perfect cooking tool to keep for emergency purposes. Keep the points mentioned above firmly in mind when shopping for a solar oven or cooker, as they’ll help you figure out which model to choose. 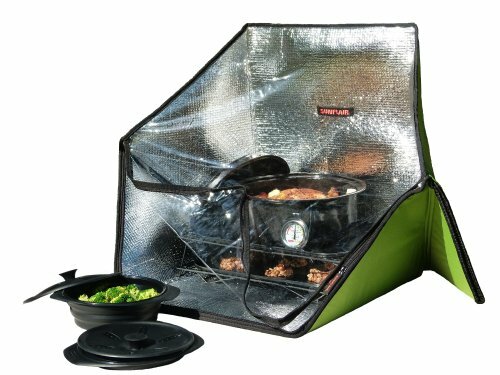 To help you along, we’ve compiled a list of five solar cooking appliances that you can use for both indoor and outdoor cooking. Most of them come with nice extras as well, while still being fully or partially portable. 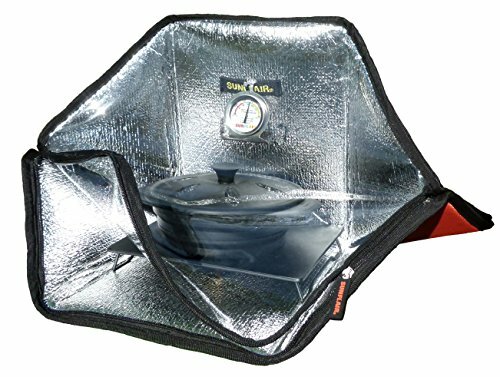 Sunflair’s portable solar oven is highly accessible and easy to use. It’s made from a lightweight and flexible material that makes it easy to fold and move it around. This means that you can carry it with you in fishing, camping and backpacking excursions. Plus, it can reach temperatures of up to 200 degrees Fahrenheit – perfect for light meals on the go! Of course, the temperature varies depending on season and location, however, A UV index of 3+ is best for solar cooking, meaning it can work just fine in the winter sun as well. That said, it might take longer for you to cook chicken on this than it does on a normal oven, for example. However, it works great for roasting nuts, drying herbs, fruits and vegetables, as well as cooking and baking foods that you don’t mind waiting for anyway like cookies, bread and stews. It is also perfect for cooking frozen meals, just make sure not to vent or puncture seals because the steem can prolong the cooking process. We definitely recommend this solar oven for someone who’s new to cooking with solar because the initial investment is small and you get to cook with the sun’s energy! However, the best part about this oven is that it’s fully portable and comes with accessories like drying racks, baking trays, a built-in thermometer, silicon pots, enamelware and even a carrying bag for when you want to transport it from one spot to another. The silicone pots can conveniently be collapsed to 2 cm and you can put them in a dishwasher, microwave, and oven safe without any problems. FUEL FREE and ZERO POLLUTION - No need for fuel or electricity. As long as there is sunshine, you can cook delicious food. No naked flame or smoke to worry about, thus it is safe to be used in such occasions as balcony, park, beach, and field. HANDS FREE - With vacuum tube cooking chamber, food will be evenly heated. Don't worry about scorching. Season the food in advance , then put them into food tray. If you like you could set time reminder on mobile phone, Then go to play. Just enjoy your leisure time! HIGH EFFICIENCY - The flexible reflectors could utilize sunlight effectively with about 96% reflectivity. In summer sunny weather, working temperature could reach up to 530°F (270°C) or so. 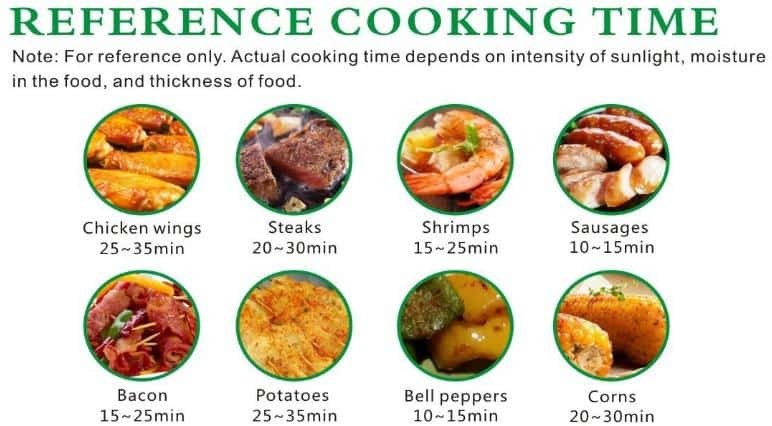 It will takes 15 minutes to cook vegetables and 25 minutes to cook meal. It can also work in winter, but should take more time. SAFE AND EASY TO CLEAN - Vacuum tube cooking chamber provides insulation to keep heat in and cool out. It is so safe to touch that children can enjoy cooking as well. Each part can be washed by water. PORTABLE - The package weigh is just 4.8lb(2kg). The dimension is 27 in(67cm) * 5.5in（14cm） *5.5in（14cm）. Accessorize with a carrying bag. The 34 oz(1.0L) capacity, about a dish one time, is enough for 2-3 people. What sets the Fondchy Grill apart is its ease of use. As the name implies, this cooker is ready to go when you are, and only requires that you point it towards the sun in order to start cooking. It has the ability to perform a versatile number of functions from cooking and baking to steaming, sautéing and roasting. We also love the fact that you don’t have to rely on full sun in order to use this unit because it operates just as well on ultraviolet light as it does on full sunlight. You’ll be glad to know that this cooker has a heating capacity of up to 550 degrees Fahrenheit which is complemented by super-fast cooking speeds! To ensure even cooking throughout, the Fondchy Grill features a heat-retaining vacuum tube that keeps the unit cool on the outside, while the food stays nice and warm way after you’ve switched it off. The vacuum tube is also what’s responsible for ensuring that the Fondchy Grill doesn’t cause a fire hazard when you’re using it at extremely high temperatures. Plus, you can fold it up into a portable narrow tube that weighs just over seven ½ pounds. All of these features make this grill an all-rounder that’s suitable for both beginners and seasoned solar cooks! The only thing you’ll have to do is to cut up the food into smaller pieces since the cooking chamber is not really big. However, its capacity is big enough to feed 2-3 people. Its outer diameter is 70mm, length 620mm, and capacity is 1.0L. It can be quite a challange to clean the cooking chamber, especially if using sauce while cooking. GOSUN Grill - A complete redesign of the modern grill, this solar grill is the ultimate solar cooker, making it the perfect compliment to your outdoor kitchen. Solar Cooking - Solar cooking is fun, safe, and easy. Plus, this GoSun Grill can be set up in seconds and there is hardly any cleanup after! Make More Food - The GoSun Grill can make 4x more food than the GoSun Sport, making it easier than ever to cook outside for all of your friends. This solar powered grill can make food for up to eight people at one time. Bake, Boil, Steam - With this solar grill you can bake, boil, fry, and steam any meal! Easy to use, this classic all encompassing outdoor grill will cook your food any way you like! Portable - Since this grill for outdoor cooking uses no dirty fuel, such as gasoline, transportation is simpler than ever and cleanup is a breeze. If you’re looking for an upgrade from the smaller and slightly limited Sport model from GoSun then this Solar Grill is it. Not only can it handle larger food volumes but it also comes with all the features that we’ve come to know and love on the GoSun Sport. Yes, it’s on the pricier side when you compare it with its smaller cousin but you certainly get what you pay for. People who’ve used it rave about how evenly and quickly it cooks, plus it keeps your food warm while remaining cool to the touch no matter what temperature it’s at, thanks to GoSun’s signature vacuum tube. The tube is so effective at “collecting” ultraviolet light that it doesn’t have to be a bright, sunny day for it to be a cooking day. The food will keep cooking even if it’s partially in a shade. Thanks to its smart design, food is cooked evenly on all sides and you don’t even need to stir or mix it. Just be careful when putting liquids inside the tube as you may spill it and burn yourself. The unit is completely safe to use and you won’t have to worry about this unit being a fire hazard either and even though it weighs 30 pounds, it’s still durable and compact enough to bring with you when boating or camping. It folds up to a portable unit that is about 7.5 pounds. This is relatively heavy, but not too big that you can’t take it on outtings. Basically, if you’re looking for the best of the best in solar ovens, this one’s for you! On top of all that, it comes with pans and a little cookbook. Make sure to bring a couple of hot pads with you because those are not included. Includes: 1 solar oven thermometer, 1 trivet, 1 collapsible silicone pot, and a handy stuff bag. No assembly required. Easy to use. Sets up and stores in seconds. World's lightest and easiest solar oven; floats and dries quickly; folds to the size of a laptop; hiking, boating, fishing, beach, construction sites, RV-ing, tiny houses, camper trailers, educational learning, emergencies, bug out bags, and zombie apocalypse. 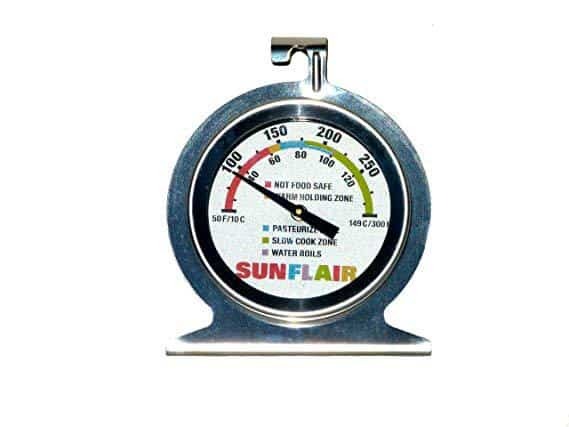 This unit is very similar to the Sunflair model that we listed above with the only difference being that it’s way tinier. In fact, it’s so small that you can fold it up, but it comes with all of the benefits, one of them being that it is considerably cheaper. Its compact size means that the manufacturer could only do so much with the design so it doesn’t feature that many features or accessories. This makes it an ideal choice for an outdoorsy hiker, camper, angler or boating enthusiast that needs something reliable to cook with while enjoying their excursion. This solar oven comes with one oven thermometer, a trivet, which doubles as a baking sheet, one collapsible silicone pot, and a handy carrying bag. It is very easy to use, with no assembly required, and it sets up and stores in seconds. Its heat potential is not to high, so keeping your expectations relaistic will save you a lot of stress. This product is great for emergency situations, cooking vegetables and fish, slow cooking, as well as for heating up meals. It’s also a good backup option for emergency preparedness as you can use it as a backup during unexpected power outages, plus it’s super affordable and easy to use – even for beginners! 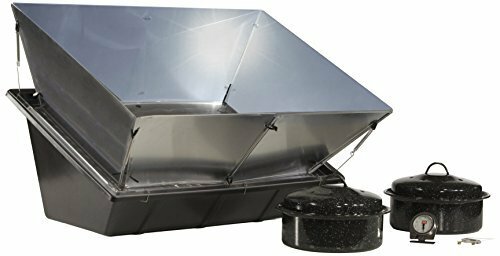 This solar oven from Solavore is a high-capacity cooker that can reach temperatures of up to 300 degrees Fahrenheit, which is plenty of heat for slow-cooking purposes. It also sports a large cooking surface that you can use to prepare meals that cater for more than just a handful of people. It’s built as a heat-retaining cooker that’s able to roast, simmer, bake, dehydrate, fry and even pasteurize! Now if that’s not versatile, we don’t know what is. We also love the fact that this oven is designed to ensure that food maintains its original color, flavor and nutrient density. What makes this solar oven different from others on this list is that you can cook two pots side by side, rather than stacking pans vertically. This allows the main dish and a side dish to cook at once, which is very practical in a variety of situations. It has a high heat potential which makes cooking much faster. You can also rest assured that this unit will stay cool to the touch throughout the cooking cycle, making it a safe option for families with kids because it doesn’t pose a fire hazard. And it’ll probably last much longer than expected thanks to its rugged nylon plastic build. Other interesting features worth noting include a built-in thermometer, a water pasteurization indicator, a removable TR-86 high-performance reflector, 2x ten-inch graniteware pots and a user manual complete with great recipes! With dimensions of 1 ft. long and 1 ½ ft. wide, this unit is perfect for large meal preparation, indoor/outdoor use and slow cooking purposes. Cooking with solar power is not only progressive but incredibly easy these days. Modern solar cookers are constantly evolving and can work just as well as the conventional gas and electric cookers that you’re used to. They can cook at the same speed, temperatures and even handle the same food capacity as most other ovens, and they’re portable as well! The only downside is that models vary in terms of these features, and sometimes the consumer has to sacrifice heating and food capacity for portability. That said, one model comes close to ticking all the boxes and that’s the GoSun Solar Grill. It can handle large food volumes, reach high temperatures of 550 degrees, retains heat while remaining cool to the touch, and it’s portable. 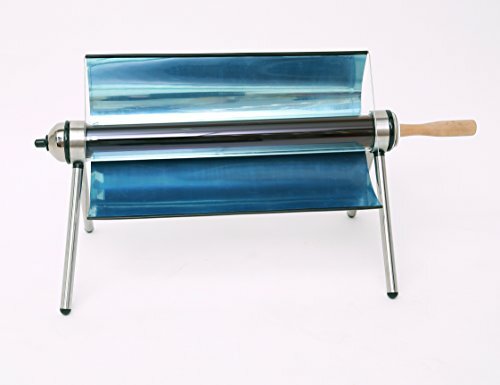 A lot of different models and brands have been introduced to the market since the release of the first solar oven. As with any purchase, too many options can make it difficult for you to decide on what to buy. One thing that helps is to look at the oven’s size, its features, cooking ability and warranty terms to make sure that it suits your needs. As mentioned above, solar ovens pretty much have the same cooking ability as normal gas or electric ovens. You can adjust the temperature as you like and cook your food for as long as you like without any limits in cooking time. Plus, solar ovens can handle all the cooking tasks that you can imagine, from boiling and baking to grilling and frying. This means you’ll be able to use your oven to make fries, bake cookies, prepare desserts, full meals etc. Again, most solar ovens come with the standard features that you’ve come to expect from conventional models, and then some! There’s the usual cooking surface and solar reflectors so you know where to place your pots and where the controls are. However, some companies will go the extra mile to include features like a built-in thermometer, collapsible reflectors, a carrying handle and even cooking pans, dishes and utensils. 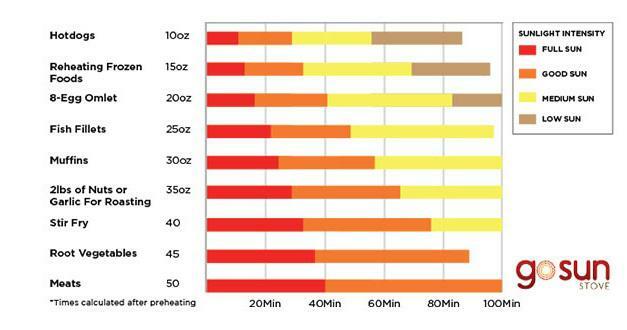 Of course, size is important too and will largely depend on how you’ll be using the oven. For example, there are people who should stick with a smaller model because they’re only looking for something that they can use for emergency cases. 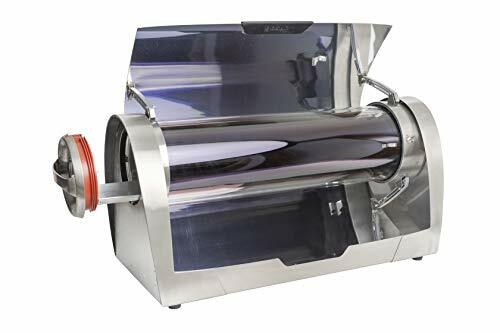 On the other hand, if you’re looking for a solar oven to use for daily cooking, baking, frying and boiling, then it only makes sense to invest in a larger model. But then again, if you want the oven for indoor-outdoor use then a smaller size will still be good even if you plan on using it regularly. As a rule, any oven that you purchase should be backed by a standard one-year manufacturer’s warranty minimum! Now, you might be lucky to get extras like a 30-day cash back guarantee or a repair warranty for certain components on the oven. 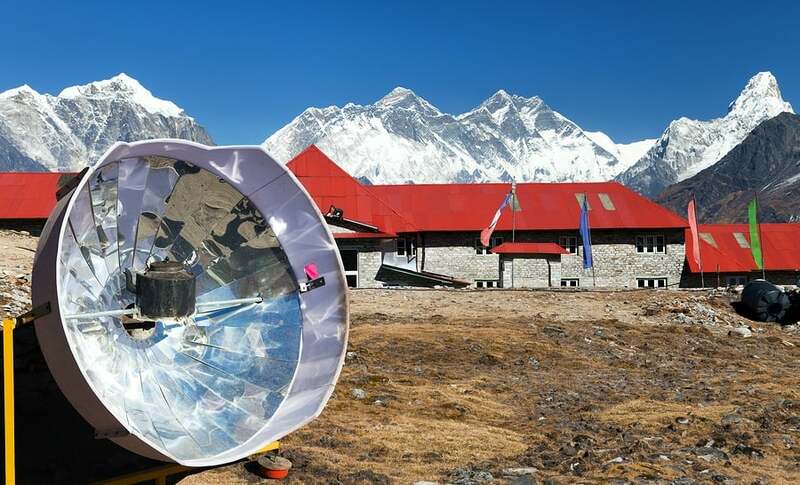 Solar ovens are a versatile cooking appliance that you can use to prepare food both in and outdoors, while still being suitable for emergency preparedness. The best part is that you won’t ever have to worry about an increasing gas or electricity bill when using them because they virtually get their energy from the sun which is free, and they’re portable to boot! Solar cooking is often likened to using a crockpot because it requires careful and methodical planning. For example, you have to be cognizant of the weather when you’re cooking and be aware that while you might enjoy a full day of cooking on a sunny day, extreme cloud cover can cut your cooking time short. Of course, you can still heat food relatively well on your solar oven when it’s slightly overcast with a few clouds here and there. But the problem comes when there’s absolutely no heat coming through from the sun. So don’t be surprised if you get situations where you have to finish cooking on your electric or gas stove just because there wasn’t enough sun on the day to get the job done on your solar cooker. You’ll also find through experience that cooking with the sun takes a bit of trial and error. For example, an oven that’s set at 280 degrees may not be able to retain that same temperature throughout the cooking cycle. Your solar oven will also be out of action on weeks that have successive rainy days, and you really have to check in on your food more often to make sure that the internal temperature of the oven is the same as your initial temperature settings. Basically, there will be some hits and misses when using a solar oven and you have to keep an eye on it a lot more than you would with a conventional stove. With that said, this is a small price to pay when you consider all the benefits that the solar over has to offer.